OneStream does not change the videos quality that are streamed unless higher than the allowed video resolution. For example, if your video file is 720p HD, it will be live streamed as 720p HD. It is important to understand that what video quality viewers see depends on their internet connection speed. If some viewers have poor internet connection speed they might see 360p or 480p and viewers with good internet connection might watch the same stream at 720p. This is automatically adjusted by Facebook, YouTube and other social media sites and known as adaptive streaming. 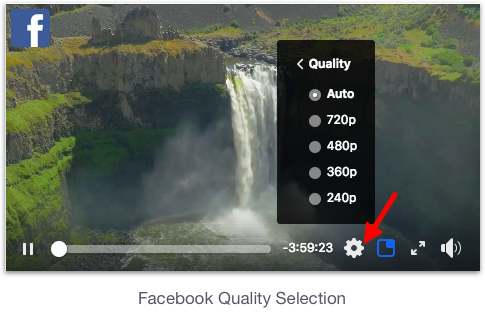 Viewers can always manually choose the video quality themselves. 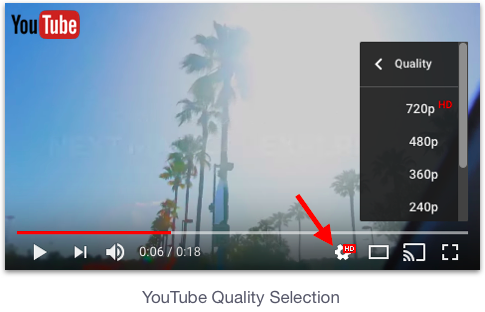 For example in YouTube or Facebook you can change the video quality by clicking the gear icon in the bottom right corner of the video. If your video file is HD you will see HD here in the options. However, if the user has poor internet connection, selecting higher video quality may result in buffering of the live stream. If you experience buffering at higher video qualities continuously please contact your internet connection provider and check you internet download speed. Please remember this is managed by the destination platform automatically.